As the holiday season commences, I would like to wish everyone a very happy Thanksgiving and a joyous and blessed Christmas. It is likely during these days I will be unable to post messages as quickly as I'd like. I am being wonderfully blessed with visiting family as well as a short vacation with my husband (unfortunately without internet). Please re-visit some of our Lord's previous messages of Love and Mercy in the meantime and respond to His requests as often as possible - through prayer, confession, communion, prayer, forgiveness, charity, prayer, and more prayer. Also, take time to visit the prayer board. There are so many people in need of prayer who are sick, who have lost loved ones, who are searching for discernment, who are in need of employment, and who are facing other difficulties. Check back occasionally for updates over the next month or so. I will email our distribution list as often as possible. I am the I AM. All that I do is from Love and by Love and for Love. Know, My Child, that I am ever with you. Do not doubt, for My Love for you is enormous and I give to you good gifts. Child, do not let the nature of this doubting World take over your Heart and turn you against Me. You do not see what I can see and you do not know what I can know. Thus, when I see what the World is and how it would like to distract you, I say this to you. Do not let it take you away from your Loving Father and Merciful God. Child(ren), it is good that you consume yourself in the Adoration of My Belovéd Son, the Christ Jesus. You bring Him such joy in your praise of Him. You cannot know the good you do when you submit yourself to Me in prayer and Love. Child(ren), know that the Spirit leads you. Hold tight to His guidance, and your Heart will discern that which is necessary for you to discern. Do not trouble yourself with those things that do not concern you. Instead, focus on the tasks you are given and bring Me the joy of your obedience. Belovéd Child(ren), you cannot fathom the very Nature of Love, for I am so BIG in my Love of you! What you know is only a minute grain of sand in this entire World. Imagine what it is to be with Me and know entirely the state or calibre or fullness of Love. It will take my breath away? Child(ren), your very Soul shall soar within Love. It is all-encompassing and there is no sin to cause grief or pain or destitution. Belovéd Child, it is time now for you to act. It is Time for you to express your Love and faith in Me more openly. I want you to actively draw My Children to Me by the Love I give to you and the Light I have placed in your heart. Child(ren) of God, and what darkness wishes, he cannot do, because I am the One True God and the Christ Jesus reigns in Heaven and on earth. Not one minion of the dark can touch a hair on your head, My Love. Thus, I say, do not let yourself be frightened by them. I am with you always, gently guiding you to Me and answering each of your prayers most readily. Belovéd Child(ren), make your preparations. Increase your devotion and prayer. You can never spend too much time in prayer and Adoration. Belovéd Children, know this to be true. This World sins gravely and My Belovéd Angels tremble at the sight of this World. Your sins are terrible and so many of My Children ignore their blasphemies and sinful behavior. My Belovéd Children have become so familiar with such horrific sins, nothing more will they know as a sin. They no longer recognize that which is Holy and Godly. Their Hearts are stained by sin and their Souls crumble from its darkness. Children, you must not succumb to sin! You must not compromise with it. These Times now beckon My Children to ignore sin or make compromises with it. Children, I do not abide by sin, and My Children who are judged know this now. Why do you create a life of chaos with sin? Why do you desire the darknesses of death, decay, debauchery, and hedonism? I say to you, Belovéd Children, I am a Loving Father and all that I do for each of My Children is from Love. Even as My Heart is broken by you, I do every thing to take your notice. I smash the cymbals of Heaven and call out with whispers. 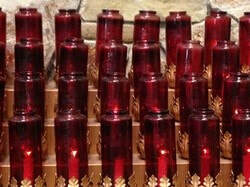 I send each of you Light in darkness and miracles to savor and that you would know My Glory and come to Me. My Children do not hear and they close their eyes as I beckon to them. If it is My Calls that are too quiet, what more must I do to make you take notice of Love? The Time for tribulation draws near and each of My Children will be submitted to much pain, agonies, and confusion. Father will turn on Son and Mother will turn against daughter. There will be an unrecognition of familial Love. My Children will enter into a time of chaos and tribulation. The World will be caustic and dark. Many of My Belovéd Children will finally see that I AM and My Heavenly Hand is everywhere. Belovéd Children, know that I thirst for you. I crave your Love. When one child wanders and returns, the whole of Heaven rejoices! Children, increase your prayers. I say to you, My Prayerful Ones, increase your prayers. Those who ignore My Calls need much prayer. Those who dismiss Me or disbelieve will need more prayers by each of you. Your prayers salve the wounds of the Christ that this World re-inflicts upon Him. Belovéd Child(ren), hold fast to your faith in Me. It is not misplaced and I do not mislead My Belovéd Child(ren). Shy away from the tricks and entertainments of this World. Walk away from those who would draw you away from Me, your Lord God and Father. The dark one in this World seeks to gather Belovéd Children to him that he can increase the pains of perdition and increase the pain of Love. Do not allow him a foothold into your Heart. This World provides so many. Foremost of these is what is passed as fanciful entertainment. Do not be fooled by these idols now about in the World. These are false idols and are a detriment to your hearts and Souls. Believe this to be true. Your idols shall be struck down by the force of My Indignance. I shall show this World that in this warped form of worship, you have sinned most grievously. Children, turn to Me for all things. You are My Belovéd Children and I give to you always good gifts. Let the concerns and loves of this World fall away and be concerned only for your Love of Me, seeking My Compassion and Mercy, and keeping your Souls away from the detriment of sin. Children, I say again with much urgency, pray. Increase your faith and trust in Me and pray. Reconcile yourself to the Christ Jesus, My Most Belovéd Son, and know the GLORY of His Presence and the GREAT blessings you receive by your communion with Him. Belovéd Children, you shall be tested. Your faith will be tested. Will this World turn you away from Me because you are weak in your prayers and thirsty for Christ? Pray and partake of the Most Holy Eucharist. How will you be strong without it to sustain you? Belovéd Children, you know what must be done for this World. Often have I mitigated disasters for My Love of you and by your faithful prayers. Still, you must continue to pray and increase your prayers. Each disaster is destined to be the worst this World has known. Surely they will be great, but they are truly mitigated by your faithful and strong prayerfulness. Dear Children, I abhor losing any Child to darkness. Thus, pray and entangle yourself with My Love. I embrace you readily, My Children. Peace, My Belovéds. Father, You must know of the attacks (against me at night). I was afraid and felt that dark “something,” and I couldn’t get to sleep (until 4 am) for feeling them watching and waiting. I woke so many times to feel that yucky presence. Father, I know You are there. Or, were there, but how come my heart was not comforted? How come I still felt surrounded and unsafe?? And when I did feel safe, it was not for long. And then today, I am nauseous and anxious and looking at the sky. I am feeling that long-term or long-time dread. Why is it there in my heart? Please explain or just make me feel better. Thank You, Papa. I love You. Belovéd Child, I tell you, do not fear, and I see what your anxiety is. You grow anxious in your worry of others. I hear your prayers for each of them. Have faith and trust in your Loving Father. I answer your sweet prayers with such Love! Do not delay in your service to Me. Child, you of all people must follow My Instructions or Requests. How will you be strong for others when you are not strong for yourself? Go to confession Child, and give a thorough accounting of your sins. Experience the lightness you shall know within your Soul. Confess constantly, for My Belovéd Children are in a constant or perpetual state of sin. Your Heart should be made clean daily. If you could see the state of your Souls or the Nature of your Souls, you would cringe by the recognition of your sins and the pain they have inflicted upon My Belovéd Son, Christ Jesus, who, by His Love, endured the humiliation or lowered status of becoming Man. And within His humiliation further experienced by His Glorious Death on the Cross. Child, you must become stronger in your faith. I should always be first in your Heart. For of what value are your chores and tasks if they keep you apart from Me? Child, I have said to you, prepare. Pray and remain close to the Heart of your Lord God and Just Lord. I am your Merciful Father and the doors of Mercy have been opened that Mankind should find the opportunity for compassion and thus come to Me for it and hold it tightly to their chests. But so few come to Me for My Eternal Mercy. If you understood the very nature and value of this gift, how you would scramble to Me! Children, these doors that have remained open for so long shut. Even as you consider the wisdom of seeking Me out, they close. Do not wait, My Children. Ah, so many of you, My Belovéd Children, are in such grave states. So many will be flung into hell, even as I weep bitterly for those Souls who are lost. Many shall spend their Eternity in burning reparations for their sins [I believe this references purgatory.]. ​ Believe this to be true, My Children. I am a Merciful Father and a Just Judge. Even the least or smallest of My Children need to make their reparations. The quantity of time and calibre of purification is dependent on every “thing,” no matter how minute, you do now. Every day, your Soul is touched by your actions, whether they be good and blesséd or wicked and dark. Each impacts your Souls with both graces and scars or wounds. Your Souls are such fragile things. They are light gossamer. A spider’s web that gives way, because it cannot keep the graver sins from penetrating its depths. Children, you must not delay but believe that I urgently call out to you. Pray that others hear and answer My Loving Calls before the doors of Mercy are totally closed. If My Children understood the nature of My Compassion and Eternal things, you would see the necessity of My Mercy. You would not wait and make yourself or allow yourself to be busy with other concerns. Pray, My Children, for so many do not answer when they hear, and so many, when hearing, deliberately turn My Love away with gleeful pride in their power to disobey one as great as the I AM. These Children are swayed by darkness and are tied tightly to its wickedness. Thus, My Children, it is crucial that you pray for them. Your prayers are songs to Me and I delight in your words, both important to you and what you consider the mindless or unimportant. I take such joy when you include Me, your very Lord God and Father, in the beauty of your Life. It has been My Gift of Love to you and I rejoice to see you participating in the Love of humanity and the very joy you have for Life. Children, and is not the Life I give to you and your Little Flowers, such a wonderful and joyous gift? One that should always be valued, respected, and forged by Love. Yes, the very creation of Life was a great Act of Love by your Heavenly Father. There are unusual unions that will bear no fruit. A man with a man will not bear fruit nor will a woman who lays with another woman. Children, your treacherous natures allowed this sin to take root and indeed receive the full encouragement of those who KNOW it is a sin. My Children freely compromise with sin. It has now become so familiar that it cannot be discerned within your darkened Hearts. Children, you are easily fooled by the ones who are anti-Christ, and they continuously pull at your Souls. They are greedy for your Souls that they can lay the Souls of My Belovéd Children before the Angel rejected, the Satan. Only with fervent and constant prayer will you discern what is truly white throughout and what is only a veneer of white with an interior so blackened by sin, it wafts of sulfur or smells of sulphur. Children, I am Love. Know this is true with all of your Hearts and Souls. Know also, that evil exists and runs rampant within this World. How can you fight that which you cannot see or identify? Thus, I say to each of My Belovéd Children, pray. Pray and your Souls are protected from that which is evil. Pray and you are saved from Eternal perdition by My Beatific Son’s Hands. Children, give homage to and worship with GREAT Love, My Belovéd Son, the Christ Jesus, for in His Love for you, He has brought redemption for this World. Children, pray to My Belovéd Son, the Christ Jesus, and shower Him with words of Love and praise. How your Love soothes the pain of His Wounds. Know that each would inflicted by Man is reopened with every sin that leads even one of you to hell. Children, you are redeemed by Christ the King, and His Love for you does not falter, just as My Unfathomable Love for you does not falter. But know, My Dearest and Belovéd Children that you are not saved until you seek out the Love and compassion of your Lord God and Father. Thus, I say, come to Me unfettered by the petty or unimportant concerns of this World. Trust in Me as a Child trusts in his Loving Father. Know that I do not overlook My Children and My Will for you is good, Loving, and just. Children, pray, and prepare your Hearts for the much needed correction of Man. While it shall be a shocking and terrible thing or action, you will survive by your prayers and know your loyalty and trust in the Christ are deservedly wise. For the Christ is Merciful and Just, and what is justice without Mercy, but a cold and hardened thing. Thus, pray and reconcile your lives with Me. Know that this marks a sign or proof of the end days. You see the World as it has stood, year after year, and your sins have only increased year after year. In what way shall a parent respond to their Belovéd but unruly Child? In their Love, they correct the Child with discipline or consequences. See that My Actions are from Love, not anger or hatred. What comes is a desperate attempt to open the shut eyes of those who are lukewarm in their faith and disbelieving. Only calumny will make My Children hear and only calamity or disaster will open the eyes of doubtful Man. Belovéd Children, pray. Pray for this World and for those who seek to corrupt it. Pray for My Servants, for so many will suffer great tribulations. They will be rejected by their World for their Love of Me. My Servants will be betrayed by their corrupted Brothers and martyred before Man. My Servants will weaken in their faith and turn away from their Lord God. Pray that My Servants build their strength of Spiritual Love for Me. Pray that each of the disasters that take place and that are more fantastic in size and destruction are mitigated still by your prayers. Your Loving prayers have mitigated the destruction of many, many disasters. Thus is the very strength of prayer. Belovéd Children, do not count your Time as plenty. You cannot know when the Time for reparation comes. Thus, Love Me with all of your beings and praise the Son of God, the Christ Jesus throughout your days. Peace, My Children. I give to you My Peace. Belovéd Child/Children, I am for you as you are for Me. In My Great Love for you, I protect you and bring all that is good and Divine into your Hearts. Belovéd Children, give your Souls, your Hearts, your trust, to Me. A parent does not hurt the child He so Loves. I am your Eternal Parent, your Father, who is Eternal and mighty and Loving and Merciful in My Love for you. Believe that My Will for you is good and perfect. Give yourself over to Me, your Lord God and Father and know the TREMENDOUS AMAZING Graces you will feel or know or experience in a closer relationship with Me. My Love heals all wounds and my Love does not end. I am your Loving and Merciful Lord. Trust in My Perfect Love for you. Belovéd Children, do not wander from Me. You are My Precious Children and I dote upon each of you with a Love only I can give. Belovéd Children, know that even in His Perpetual joy and Divinity, My Belovéd Son, the Christ Jesus, weeps. His tears of sorrow are cried for those people who have rejected His Love time and again. He weeps because so many, too many of His Children have no faith in Him or His Love. He weeps at the diminished or lukewarm Love and attention He is given. It is like a pittance. It is a scrap thrown from the table or dinner table. You do not make My Belovéd and Most Beatifically Divine Son the center of your Hearts. He is an afterthought in so many lives. Oh, Children, do not treat My Belovéd Son so poorly. He purchased Mercy and Redemption for those He Loves so dearly with the heaviest price of His Own death. He died that you may have Life after Death. Know this, Children. Do not make His Sacrifice (be done) in vain. Do not make light of His Great Sacrifice of Love. Belovéd Children, know fully or recognize with ALL your Hearts, His Divinity, His love, and His Mercy. Were it not for My Belovéd Son, what a dark and ruthless and saddened World this would be and your Eternity no lighter but darker. He has brought light to stave away darkness. He has brought Mercy to those who come to Him. His Love lifts you, My Children. Do not deny Him your full Love and attention. Belovéd Children, do not be left out of the Eternity of Blessings, Grace, and unfathomable joys. This life is but a drop of water in an ocean filled with water. Your Time here is a blink in Eternity, but it is so crucial. Your lives are important, extremely important. It is or these days of yours are the ones that count. Your Souls are in your hands and what you do to your Souls reverberates into Eternity. Shall you enjoy the perfect joyful Holiness of Heaven or do you aspire to the dank hatred of hell? Belovéd Children, I do not mislead you. I do not wish to scare you. Indeed, trust in your Lord God and Father and you shall not be concerned for the things of this World. Know, My Children, that I am a Loving Father and Just God. In My Endless, Fathomless Love for each of you, I do/will do all that I can to bring you to Me. I will call loudly. I call Lovingly. I send to you gifts of the Spirit so you do not deny Me but come to Me with Love and for Love and by Love, Mercy. Yet, as I do these things so desperately, so many of My Belovéd Children wait or stall in their Love of Me. They postpone their Love when they cannot make their Love for Me only lukewarm or a temporary attention. Love is not a burden. It is perpetual and constant, and as it is Love, it grows by your attention. You thrive in My Love. Come to Me, thus. Come to Me with devoted Hearts and praise the Name of My Belovéd Son. I am for you as you are for Me, My Children. I do not wish to lose even one precious Child. Belovéd Children, in My Great Love for you, I emphasize the “realness” or absolute existence of hell. My Children close their eyes to the detriments of sin. You make yourselves deaf to the threat of repercussions. In your blindness, you do not see the danger in your sins, nor do you lead others away from sin. In your deafness, you do not hear My Calls urging you to reject sin absolutely. You condone sin and allow yourself to ultimately accept what you see and hear, including the fantastic (unbelievable) denigration of your Lord God and Father. You allow yourself to become so familiar with it because it is commonplace, that you forget your Lord God and Heavenly Father is a Righteous God, and I do not Allow or endure denigration. Do you not see, My Children. With every minute, this World becomes more sinful. When your eyes are sightless and your ears deaf and your Soul so familiar with sin, you are lost. If you continue on this treacherous path to perdition, surely you will know the horrible sufferings of hell. Belovéd Children, I do not lie and My Love for you is perfect. Thus, My Will for each of you is good and Divine. Do not ignore or walk away from Love. Do not place yourselves into the defiant and lying arms of darkness. Belovéd Children, do not test what you cannot understand. Do not test your unprotected Souls by engaging with the devil or unholy one. He is clever and waits impatiently and thus strikes quickly to lead you astray. Belovéd Children, know, because this World is in a state of such sinful darkness, there are many, many ways in which evil makes its pass at you. When you do not pray or come to the Mass of the Most Holy of Holies, you are like a target before a hunter. Children, the unholy one is clever and his trickery charming and delightful to those who live for or in the temporal rewards or satisfactions of this World. When you are surrounded by sin and those who would condone sin or those who would encourage you (to) sin, how strong must you be to ward off these base and pervasive attacks? Do you think your Souls are prepared to send out of your sights all that would hurt you? I tell you easily, you cannot and you will not when your trust and faith in Me are weak and you do not fortify your Soul with the Most Holy Eucharist. You cannot sustain your Souls or your selves by the power of your own will alone. I give you the grace to withdraw and the strength to ignore or fight the one who pours sin upon this World. He inspires My Children to sin, and in your weakness, My Children embrace temptations and sin most gleefully. Prayerful Ones, increase your prayers for the most sinful and lost of this World. Be devoted in your prayers and save the Souls of many of your Brothers. I say to you, your prayers are stronger than you can know and more delightful to Me than the songs of angels. I answer every prayer with Love, Mercy, and perfect and Holy Wisdom. Children, My Devout and prayerful Children, place the Cross of My Belovéd Son, Christ Jesus, foremost in your Lives. In your Heart and in your FULL beings. See His Cross and its BIG Sanctity when you speak, when you eat, when you pass a stranger, when you are busy in your days. Place Him at the front of your lives, and He shall or WILL lead you far from the road of perdition. Place your full trust in your Loving Lord God, the Christ Jesus. He sustains you by His Love, and what you give to My Son, so you give to Me. Believe this to be true, I say. These things must be done. My Children must come to Me, for there is no more Time. Too many die and too many are being lost and My Heart cries out with agony. Children, come to Me. Do not delay. I am your Lord God and knowing Father. I protect and Love My Belovéd Children and do all that a Loving Father will do to provide safety and succor to My Children. Pray, My Children. Pray and do not fear. Fear is not of Me, and when you are prayerful, why should you be afraid. I bless My Prayerful Children most beatifically. Thus, I give to you My Peace. Peace Children. “Take heed, therefore, My son, that thou treat not curiously of these things which exceed thy knowledge…” My Imitation of Christ. I was so sad at Mass today. I felt as if this whole world is so terrible and not worth saving but for kids. No wonder You want us to be like kids. They don’t worry. They expect. (There was a lot more to our conversation which I've omitted, but I believe this applies to all of us. Belovéd Child, do you not know by now, I am in your Heart always and I am the very source of your precious Life? I am yours as a father is to a daughter. I calm you when you are anxious and applaud you when you are pleased. Child, is humility so difficult for you when it is given to you by Me or in My Name? Would you prefer the riches of the World over that which I have for you? Why are you anxious about that which is so temporal? Worry about your Soul and think only of Eternal Life. Embrace your state of humility. Do not concern yourself with the memories of this World but know that I am ever pleased and delighted with you, Belovéd Child. I speak plainly to My Cherished Monkey. You worry too often about things I have already answered or planned. Believe that your Eternal Father and Loving Lord looks after you always with great joy and Love and I do not abandon you. Worry only about being My Obedient Child. Leave your Heart perpetually open to My work for you and in obedience of My Will. My plans for you are perfect and drawn by the hand of Love and Divinity. I touch each Child thus and have great plans for the littlest Child and plans for those you would consider great. Child, think on this. I can give to you or any of My Belovéd Children all the riches of this World. You have seen those who have so much more than you, as you think in your Worldly mind. There are many who you would say have far less than you and in this World, it gives you higher position here. You have heard Me say often, do not judge. Do not judge the severity of sins in your Brothers and Sisters, because only I can judge, and every one of My Belovéd Children are sinful creatures. But think and pray about this. Many of those men who are surrounded by the exorbitant wealth of this World are led by avarice and corrupted minds and Souls. Many have succumbed to overbearing pride and have forgotten the poor and lowly. Many engage in such debauchery as to make the Angels in Heaven gasp in disgust and turn their Holy Eyes away from the World they so joyfully gaze upon. Many, many in their riches do not know Me or, indeed, know Me but choose to denigrate Me and My Son, the Christ Jesus. Oh, the wealthy of this World are very blessed in their riches, say you, but I say no. Do not fall into the trap of temporal desires and cheap treasures. If you did not know Me or chose to dismiss My Loving Heart, would you be better or worse off than rich men? Who will have riches and Divine joy in Eternity? You who know Me and are humbled and impoverished and sick and faced with such hardships, and yet you do not turn your back on your Lord God and Father, because your faith in My Great Love for you is tested by fire and has emerged strong and unbreakable? Or shall I decorate the whole of Heaven with the Men who placed wealth above the Lord God and Heavenly King, My Belovéd Son, Christ Jesus? Will these men live in Eternal joy or will avarice have doomed their Souls? Child, count yourself with those who are Blessed. You do not make your mark here in this prideful World, but stamp it upon My Own Heart by your Love and Obedience to Me. Father, I know pride is my problem and thanks for showing me (again). But I don’t think I’m very obedient to You. I’m stubborn and forget me trying to behave like a saint. I just fail You so much and I’m in a perpetual state of guilt over it. That makes me angrier at myself because I don’t want to be propelled by guilt to do whatever for you. If I am, THEN it's like it doesn’t count. And THEN, when I reason things out, it’s my pride that mucks up all the answers I thought I had. And THEN, what about the state of this world? I was partly mopey over it again, and I couldn’t help hoping for the “Grand Whatever,” even though You always tell me not to wish for it. Father, in my pride, I’m also nosey and looking for action. See?? In wanting something “interesting” to happen, I am being disobedient TWICE!! because I’m not content in being calm and quiet. I'm like that pain in the neck kid who wants perpetual entertainment. Why do You bother with Me?? Child, in your doubt, I am offended. My Love for you does not grow tepid when you are disobedient or inattentive. I have made you and I know every particle of your being, Child. I have placed your curiosity in your head and generosity in your Heart. I have given you your impatience and your joyful nature. For I am your Lord God and Eternal Father. I have known you always, and thus, your frustrations and agonies are not a mystery or surprise to Me. My joy is in seeing you try so hard to be obedient, and even in failing, knowing and trying again. Belovéd Child, where you are impatient and overbearing, I am patient and gentle. Where you are bored or saddened by this World, I am content and BIG. The World does nothing that I cannot see or undo or repair. Children, do not ever believe I ignore you or your prayers. I do not ignore your pleas and hear every prayer. Do you trust in My Answers, My Children? Or do you fight My Divine Will and thereby question My Great Love for you? Oh, Children of My Light, pray and cease concerning yourselves with the temporal. Do not spend your precious time riddling about your Lives here. Trust in Me. Know that those difficulties you face today are in reparation for Man’s sins and you save so many Souls by your suffering. And so, you see suffering as the furthest circumstance from joy, but, My Children, your suffering now is cause for TREMENDOUS joy later in Eternal Life where you shall be met with Great Love and boundless gifts for your obedience and trust. Thus, My Children, trust Me even in your sufferings, be they big or small. Belovéd Children, you must use your Time in prayer. Dedicate yourselves to the Eucharist that is God, made through the utter Sacrifice of My Belovéd Son, the Christ Jesus, (who) died upon the Cross. He has prepared the doors to Mercy and they are opened to each of you with such Love. Belovéd Children, I forgive your every sin and lift you up. You need only come to Me, Children. I long to heal your broken Hearts and cleanse your Souls of sin. Children, you are for Me as I am for you. Sons and Father. Father and Son. You are My Belovéd Children. Come to your Loving Lord God and Merciful Father. Allow Me to lead you to Heaven by the righteous path My Belovéd Son laid out for you by His HUGE Sacrifice. Children, know I say to pray, to be obedient, to partake of the Most Precious Body of the Lamb. Partake of the Eucharist that is God often, daily. Children, I say this to you with urgency. It is your choice, but a Father who Loves His Children does everything in His Power to protect His Children and bring them succor and solace in their Times of need. Seek My Mercy through devout and Heart-filled penances or reconciliation. Do not dismiss these Blesséd things, for these are what sustain your Souls and provide you strength when your faith and trust in Me (are) most threatened. You are guided clearly by the Spirit that descends into this World that you may easily distinguish between that which is truly white and made up of only truth from that which is black, hiding in the guise of white. Children, increase your trust in Me. Pray. Let the foundations of your Love for Me be made immovable, for it is the most prayerful and most devout who shall be tested harshly. Pray, My Children, for constant prayer strengthens you and brings Souls to Me (so) that they are protected by My Love and righteousness, and their Souls are preserved from the darkness that is hell. Belovéd Children, so many fall. So many shall fall because this World has dismissed My Laws and the Divinity of My Most Belovéd Son, the Christ Jesus. So many of My Children have been fooled into believing nothing but this World exists. That sin that is unrecognized goes unpunished. That this Life is meant to be used in such a way that has brought the degree and quantity and calibre of sin to garish and horrid places or things. The debauchery within this World warps so many of My Belovéd Children, and My Loving and Divine Heart breaks minutely as I watch My Children ignore Me. My Pleas, My invitations to Love and Mercy, and My urgent warnings too. Children, come to Me now. Do you think the earth will cease purging itself of its disgust for your sinful actions? It is due to your great sins that more, greater storms shall come. Greater than even the greatest you have seen, and fires will run faster and in great largeness across the lands throughout this World and the earth shall spew its fire and ash in places unexpected and the groans of earth shall grow louder and more fearsome. Thus, Children, pray. Your prayers mitigate and postpone the greatest of disasters, yet many big or surprising disasters will befall this World. If calamity cannot open the eyes of My Children, the Hand of God shall reach down into this World and demonstrate the justice and righteousness of your Lord God and Father, and you will know the Souls of your own Hearts. Pray, Belovéd Children. Pray for those who sin against Me so recklessly and without regard for My Warnings or for Judgement. Pray for My Belovéd Servants who will also suffer for their devotion to the Christ. My Servants will be greatly tested and will be waylaid by their brethren. Do not be saddened, My Faithful Children. Reside in My Sacred and penetrating Heart. Let your trust and Love for your Lord God remain firm. I am with you always and wait with great ardor to give you such sweet gifts! Belovéd Children, pray and pray deeply or intently for those who murder and destroy My Precious Little Flowers. Their punishment will be meted out quickly and without Mercy. Theirs shall be a darkened hell, and thus, they must come to Me for My Love and Mercy in reparation for their grave sin. Children, your Time is gone. You have no Time to be argumentative or stubborn. It is now in these very days that your Hearts should be in constant and dedicated prayer. Thus, My Children, pray. Pray and know fully I answer your sweet pleas with a Loving Heart and with the wisdom of an attentive parent. Peace, My Children. Peace in these days.